Hajji Dede Edmond Brahimaj, world leader of the Bektashi Order (left), and Professor Dr. Shezai Rrokaj, an Albanian member of Parliament, sign the Peace Road banner in the Albanian Parliament. Many VIPs attend the opening ceremony of the 2018 Balkans Peace Road in Albania’s Parliament. 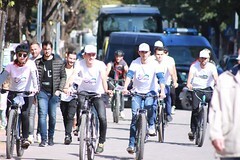 Young people ride bicycles in Tirana, Albania’s capital, as part of the 2018 Balkans Peace Road. Tirana Deputy Mayor Andi Seferi (center) passes the Peace Road flag to a young Peace Road participant. Shkodra Mayor Voltana Ademi (left) is awarded an Ambassador for Peace certificate by Dr. Michael Balcomb and Mrs. Fumiko Balcomb, the UPF regional chairs for Europe and the Middle East. Peace Road bicyclists ride through Podgorica, the capital of Montenegro. Podgorica Deputy Mayor Sladjana Vujacic (center) receives the Peace Road flag from Mr. Jack Corley, UPF chair for Eastern Europe, and then hands it over to a young Peace Road participant. A UPF and Peace Road delegation pay a visit to Rozaje Mayor Ejup Nurkovic (back row, wearing white cap) in his office. 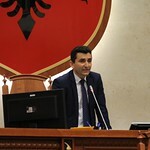 The speaker of Macedonia’s Parliament, H.E. 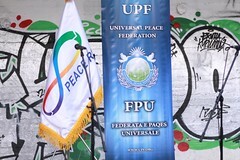 Talat Xhaferi (front row, wearing white cap), with Peace Road participants at a congratulatory banquet in Skopje organized by UPF-Macedonia. A children’s folk-dancing group wearing the native costume of Kosovo after performing at the Peja, Kosovo, rally for the Balkans Peace Road. Pristina, Kosovo, Mayor Shpend Ahmeti receives an Ambassador for Peace certificate from Dr. Michael Balcomb and Mrs. Fumiko Balcomb, UPF regional chairs for Europe and the Middle East. The 2018 Balkans Peace Road banner is signed by (left to right) Mr. Sinisa Ruzicic, a professional football coach and journalist; Mr. Jack Corley, UPF president for Eastern Europe; and Mr. Giuseppe Cali, UPF president for Southern Europe. Some of the 2018 Balkans Peace Road participants with their bus in Croatia, on their way from Serbia to Bosnia and Herzegovina. Thirty young teens play in a football tournament in the town of Bugojno in Bosnia and Herzegovina, organized by Football for Peace together with the 2018 Balkans Peace Road. 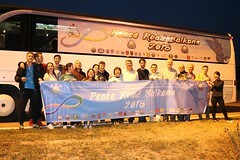 The 2018 Balkans Peace Road banner, showing the route of the Peace Road tour, after being signed by participants and VIPs. 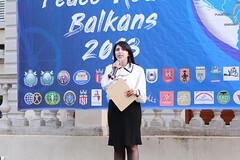 The first event of the 2018 Balkans Peace Road took place on October 3 in the Albanian Parliament with the presence of the deputy speaker of the Parliament, Professor Vasilika Hysi; former President Alfred Moisiu; the world leader of the Bektashim Muslim order, Hajji Dede Edmond Brahimaj; the coordinator of IAPP in Albania, Professor Dr. Shezai Rrokaj; and many current and former members of Parliament, Ambassadors for Peace and young people – altogether 150 people. 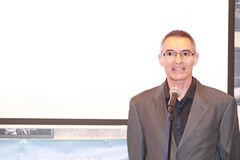 The evening program continued with a congratulatory banquet organized by UPF-Macedonia. The speaker of Parliament, H.E. 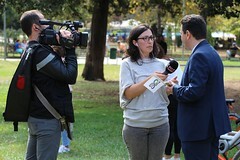 Talat Xhaferri, attended and congratulated the Balkans Peace Road participants, encouraging them to keep conveying peace messages in the troubled Balkans. 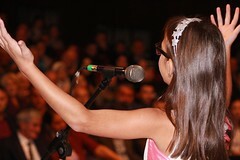 Click on the images below to view the photo albums.